Painter Henri Matisse once said, “Creativity takes courage.” Perhaps it also takes the right kind of help, such as the right tools for the job. This could be especially true for digital natives, who create from their gadget of choice as well as from inspiration. Enter the Lenovo Yoga 900. Powered with the latest Intel Core i processors and advanced specs despite weighing very little, the Lenovo Yoga 900 is an ideal device for creative spirits in need of an ultrabook for work and play. 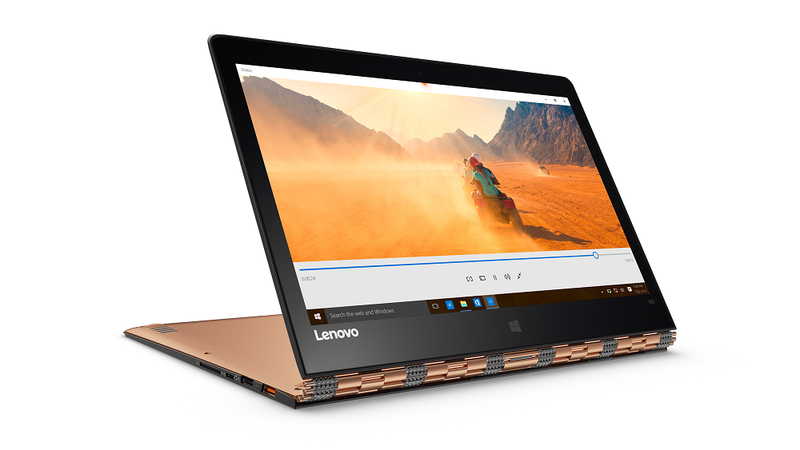 The Lenovo Yoga 900, being a Windows 10 laptop, allows the user to conveniently download audio, photo and video editors and other useful applications from the Windows App Store. With a 13.3” QHD+ panel that displays true-to-life colours, a 3200 x 1800 native resolution, and an Intel HD Graphics 520 graphics card, users can precisely edit images and videos without worrying about messing up the resolution. It is also equipped with JBL Stereo Speakers and Dolby DS 1.0 Home Theater for high quality audio output. To draw closer inspiration from nature, take your Lenovo Yoga 900 outdoors. Whether you wish to work under the sun or under the stars at night, the Lenovo Yoga 900 has got you covered with its bright display and light keyboard. This laptop is light in weight yet heavy on performance. It can manage audio, photo and video editing simultaneously because it is powered by a 6th Generation Intel Core i7 processor and a 16-GB RAM. Users can expect nothing less than a powerhouse performance from the Yoga 900. With the Yoga 900, creativity and productivity will be the constant theme of your days. When Gossip Girl character Blair Waldorf said “Fashion knows not of comfort”, she obviously hadn’t met the Lenovo Yoga 900. Guess what, Queen B? Fashion does know comfort thanks to this sleek and stylish laptop. It weighs only 2.8 pounds and has a remarkable 0.59-inch thinness, making it the world’s thinnest Intel Core i device. This lightweight laptop is so easy to tote around, you can switch to photo opp mode anytime without straining a muscle. The Lenovo Yoga 900, enclosed in an aluminum magnesium case, comes in three stylish colours: Clementine Orange for those with pep, Platinum Silver for the minimalist and Champagne Gold to project luxury. Totally #OOTD-friendly! Artists, like other professionals, need a break every so often. With its flexibility, the Yoga 900 can be a tool for an artist at work as well as a great companion for an artist at rest. The star feature of the Lenovo Yoga 900 is its watchband hinge, which makes it the laptop that is as flexible as its user. It can be used for a limitless number of activities in four different ways: laptop, stand, tent and tablet modes. The laptop mode can be used when writing articles or creating impressive PowerPoint presentations on Microsoft Office. This mode also comes in handy when working on creative projects on Adobe Photoshop or with other editing software, giving you full access to the keyboard and trackpad. The stand mode comes in handy during meetings for projector-less presentations. It is also convenient when it’s time to just sit back, relax and watch movies or catch up on the latest episode of Project Runway, The Apartment – Design Your Destiny, The Game of Thrones, How to Get Away with Murder, and other TV series at home, at a café, in the park, and even on a plane! Playing games on tent mode is the best way to beat a high score because balance is maintained even amidst aggressive swiping. Topping the score board has never been this easy! When put on tablet mode, this ultraportable convertible is definitely a great travel buddy for those consumed by wanderlust. Time to get some Vitamin Sea! The Lenovo Yoga 900 is a portable 2-in-1 that doubles the fun!